From january 2016 to july 2017, the automotive industry is the third sector – excluding energy – by number of investment projects (7% of the overall number of projects), second by number of jobs created and eighth by amount invested (fourth if energy related sectors are excluded). 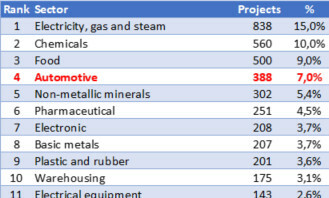 During this period, 5582 investment projects have been detected by Trendeo worldwide. Our users can access the name of the investing groups, the location of the plant and an industry 4.0 ranking, from 0 to 12. Since January 2016, Trendeo has been collecting data about industrial investment worldwide. Data collected are of quantitative (amounts invested, jobs created) but also qualitative (description, Industry 4.0 ranking, customers, suppliers, location…) nature. The database containing all this information can be accessed at www.industries-strategies.com by all our subscribers. This project has been supported from the beginning by EDF, Fives, the Institut de la Réindustrialisation and the Programme d’investissements d’avenir Defi&Co.